PHLADELPHIA -- The NFL has released a list of free events during the NFL Draft on the Ben Franklin Parkway in Philadelphia. ROUND 1, set for Thursday, April 27 at 8:00 PM ET, will include prospects walking the red carpet before the start of the NFL Draft. On Friday, April 28 starting at 7:00 PM ET, thirty-two former players from the NFL Legends Community - along with past recipients and team winners of the Walter Payton NFL Man of the Year Award presented by Nationwide - will announce selections for ROUNDS 2-3. The NFL is launching an official companion app, NFL Draft - Fan Mobile Pass, to guide visitors through the NFL Draft Experience in Philadelphia and to also provide exclusive chances to win prizes - including exclusive Draft memorabilia, the ability to collect badges at interactive events, and more. Fans may visit NFL.com/apps/draft later this week to download the app. 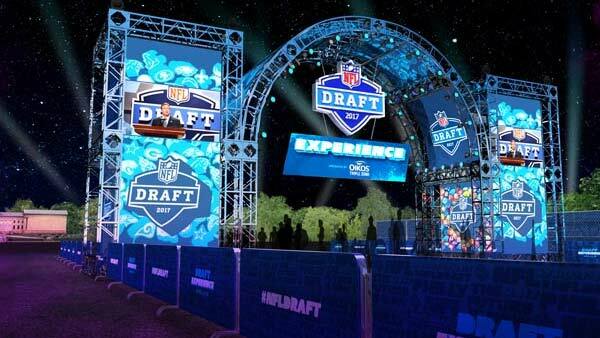 As construction of the NFL Draft stage continues, the league has released more images showing what the Ben Franklin Parkway will look like during draft week. The free NFL Draft Experience presented by Oikos Triple Zero will feature interactive elements, flag football competitions, concessions, player appearances/autograph signings, NFL Shop at Draft presented by Visa, the NFL PLAY 60 Zone presented by Danimals, where youth football clinics will take place, visits by Draft prospects, and more. Zip to the Future presented by Oikos Triple Zero - Fly over NFL Draft Experience on a 100-yard zip line. Due to high demand, timed reservations will be made available via Fan Mobile Pass. - Vertical Jump: Take your position at the vertical jump and find out what the difference between your reach and the flag you hit is, just like at the NFL Scouting Combine. - 40-Yard Dash: Race down the field against digital NFL players on a 40-yard long LED wall. Hail Mary - Test your long-distance accuracy by throwing a deep pass over defenders into a drop-in net. Oikos Triple Zero Field Goal Kick - Test your ability to kick a field goal through NFL uprights. Touch Pass - Master one of the most difficult throws for an NFL quarterback by throwing the ball on an arc over a defensive player and into a net. NFL Virtual Reality - Experience NFL games using virtual reality technology. NFL Draft Set - Visit the official NFL Draft set from Thursday to Saturday and see the view from behind the podium. ESPN Set - Check out SportsCenter LIVE from NFL Draft Experience. NFL Network Desk presented by Ford F Series - Take your seat behind the NFL Network Total Access desk and break down the game. NFL Draft Experience Tailgate - Enjoy selections from some of Philadelphia's best restaurants in a "taste of the town" tailgate. NFL Museum (Pro Football Hall of Fame display area) - This exhibit features historical Hall of Fame memorabilia, a full collection of 50 Super Bowl rings, Conference Championship trophies, and a chance to create your own digital Hall of Fame bronze bust. NFL Auction Prizes and Giveaways - Located in the NFL Museum, stop by for cool giveaways and chances to win unique NFL instant prizes for registered fans. View game worn and signed memorabilia available only on the NFL Auction website, and learn about the charities and foundations that the NFL and NFL Auction support. Vince Lombardi Trophy - Take a photo with the Super Bowl trophy. AFC & NFC Locker Rooms - Visit a replica NFL locker room as it appears on gameday. Experience the sights of an NFL pregame with sleek transparent LCDs. College Football Corner - Fans can view College Football Hall of Fame memorabilia from former first round Draft picks and Eagles legends, and cheer on Draft prospects from their favorite college team. Life size player mannequins offer unique photo opportunities. Aquafina NFL Helmet Photo Opportunity - Find your favorite NFL team oversized helmet and have your photo taken by an Aquafina brand ambassador. Share your photos through your favorite social channel and the Fan Mobile Pass app. Bridgestone Experience at NFL Draft Experience - Dive into the action, make the winning catch in our football photo experience, pose in an NFL Draft picture frame, and challenge your friends to an interactive football game. Bud Build A Bar - Attendees can grab their friends and try their hand in the Bud Light Vend Zone, a fully-customized vending machine that rewards attendees with each successful throw of the football. Afterwards, snap a pic in front of the Bud Light can wall and enjoy other games. Campbell's - Campbell's soup will be rolling into the NFL Draft Experience in their food truck with samples of two fan favorites, Campbells Chunky and SpaghettiOs. NFL players will be making special appearances at the sampling truck throughout the weekend. After filling up on samples, fans may head over to the NFL PLAY 60 Zone Obstacle Course presented by Campbell's & SpaghettiOs to test their football skills. Courtyard - Courtyard, the official hotel of the NFL, will celebrate the Draft coming to Philadelphia with lively fan interactives, including "Be a Broadcaster Video Smash-Up" and a "40-Character Dash." Fans will have access to NFL stars, compete to win prizes, and experience Courtyard's hospitality. FedEx Shipping Center - Send home your officially licensed NFL Draft merchandise from the convenient FedEx Office Shipping Center. NFL Draft Tavern presented by Bud Light - Grab a drink and support your team during the event at the NFL Draft Tavern presented by Bud Light. NFL Shop at Draft presented by Visa - Stop by for the largest assortment of NFL Draft merchandise, including customizable Nike Jerseys and the official 2017 NFL Draft Cap by New Era and exclusive Draft gear. NFL SUNDAY TICKET True Fan Zone - Stop by to learn how you can stream every out-of-market game, every Sunday afternoon from your favorite devices. Then, step into the "Sound Off Station" and show everyone your passion for your team. Oikos Triple Zero Sampling Truck - Visit the Oikos Triple Zero truck to sample protein packed snacks from the Official Yogurt Sponsor of the NFL. Oikos Unstoppable Drop - Take your chance at dropping a football down larger-than-life Oikos Triple Zero gameboard. With the right bounces, fans could instantly win exciting NFL Draft prizes. Panini America - The exclusive physical trading card partner of the NFL, Panini America will give fans the opportunity to win packs of Panini NFL trading cards and receive the Panini NFL Sticker Album. Fans can create their own digital Panini trading card, interact with their Panini Gridiron app, and learn how to collect the actual trading cards of this year's Draft picks from Panini Instant. Rolling with the Rookies presented by Hyundai - Four Santa Fe vehicles will be wrapped with designs by renowned cleat artist Marcus Rivero, and each vehicle's wrap will reflect the unique life story of four potential first-round pick rookies. Inside "Rolling with the Rookies," Hyundai is going beyond the numbers by showing the life journey of these four rookies in its first original NFL content series highlighting the people, places, and experiences that truly shaped them. On display, in addition to the custom designed vehicles, will be four immersive exhibits highlighting footage and memorabilia from each player's life. SiriusXM - SiriusXM NFL Radio and SiriusXM Fantasy Sports Radio bring expert analysis of the 2017 NFL Draft to the Draft Experience. Stop by, see your favorite hosts, listen to live coverage of each pick, and get all the big news that will impact your fantasy team. Skittles Makes the 2017 NFL Draft Awesomer - Visit the Team Skittles Locker Room to make your NFL Draft Experience Awesomer with exclusive Skittles photo-ops and delicious samples. Tostitos Cantina - Engage with current and former NFL players while they talk about their experiences during past NFL Drafts and grab a bag of Tostitos Tortilla Chips. 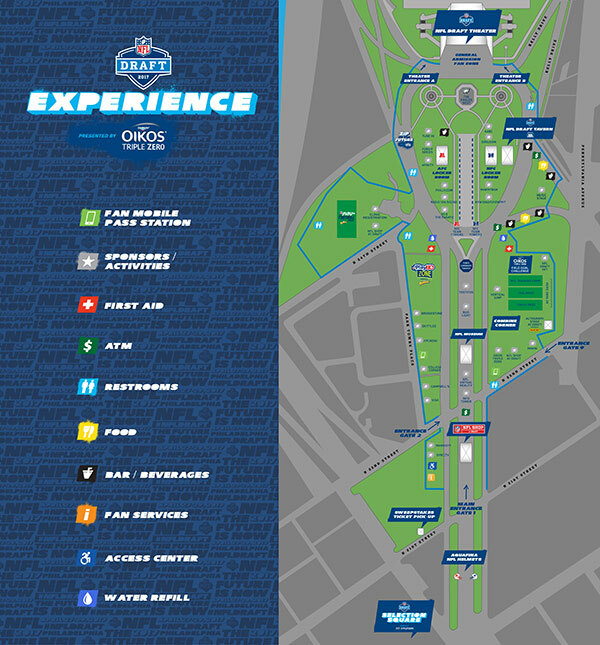 XFINITY Zone at NFL Draft Experience - Visit the XFINITY Zone at NFL Draft Experience and catch live NFL Draft coverage on NFL Network, meet NFL celebrities and players, win prizes, and more. Visa - The Visa activation at NFL Draft Experience will showcase an innovative retail experience. Visa and M&T Bank have teamed up to offer gift cards and dedicated check-out lanes for fans who complete a mobile pay demo. Stop by the Visa activation in NFL Draft Experience to demo the latest technology. Gear Up and Go - Try on NFL equipment and feel what it is like to gear up for gameday. NFL PLAY 60 App Station - Run, jump, and turn through a simulated world in an app designed by NFL PLAY 60 and the American Heart Association. NFL PLAY 60 Challenge Virtual Field Trip - Take a virtual field trip with the NFL and the American Heart Association to learn how easy and fun it is to get active and heart healthy. NFL RUSH Gameday - Experience gameday with an app designed for kids to play fun games, customize their own avatars, watch awesome videos, and unlock cool digital gear from their favorite teams.